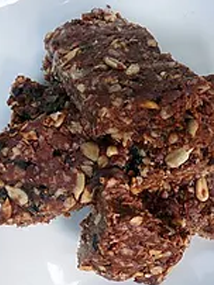 These snack bars will definitely cure you of any food cravings, which makes them great as an emergency backup! – In a large bowl, combine the oats, flax seed meal, seeds and nuts; mix thoroughly. – Add agave nectar to the mixture and stir until well coated. – Add peanut butter (or other nut butter) to the mixture and mix until well combined. – Scoop the mixture into the prepared pan/baking dish and press firmly until it is evenly distributed. – Remove the entire block from pan/baking dish, then cut into 10 bars. Best to store them in the freezer. Enjoy! !